To some, a stack of overturned buckets topped with a sloppily arranged section of bright green plastic grass might not seem like an obvious or even logical design choice with a defined purpose. To the newsstand operators on the corner of Montague and Henry Streets, that purpose is clear: something needs to support the automatic Lotto reader at roughly the height of a human hand. The streets of New York are ripe with contraptions created from the melding of disparate objects. The things in front of us can be repurposed indefinitely, taking on new lives and accruing new meanings as they are attached to each other. This fusion of materials not only creates new histories, but new dialogues among the objects themselves as well as the people that interact with them. New artifacts are created from the reinvention of material and use. Need and availability give birth to strange hybrids that live parallel to intention and accepted definitions of application. Solutions are generated by the manipulation of forms and transformed into things that look like other things. What are the functions of an ephemeral assemblage built to suit an incredibly specific situation? How will future generations even begin to analyze the uncategorizable artifacts cobbled together from the materials at hand? 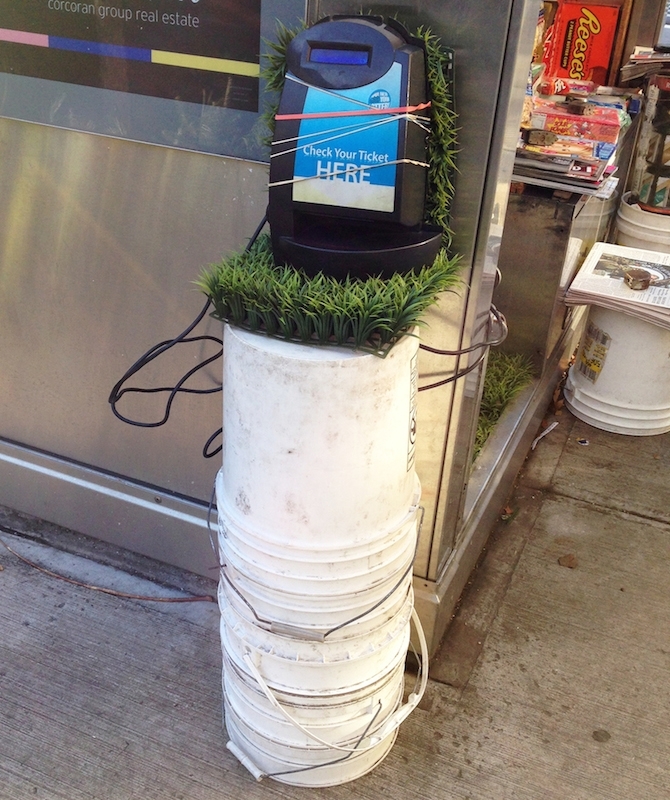 It might not be for us to answer those questions, but if you need to display your Lotto ticket scanner, all you need is a collection of buckets and a patch of fake grass.